Retire Early in India: How much should I save before I retire? How much should I save before I retire? The critical question for all retirees is "Have I saved up enough money to last the remainder of my lifetime?" I had written earlier, about how to calculate the corpus you need to be able to retire financially independent. The amount you need depends on only 2 factors, your estimated annual expenses, and the number of years you need to live in retirement. Here is how I have calculated the corpus I will need, before I can retire. The first thing I did was to calculate my estimated annual expenses. I am now estimating that I will need to live in retirement for 50 years. I know this sounds like a very large number of years, but then the whole idea is to be a little conservative, to ensure that I don't run out of money in my golden years! Then I refer to the table I had worked on earlier, to check how much my retirement corpus should be. I have reproduced the table here below for reference. 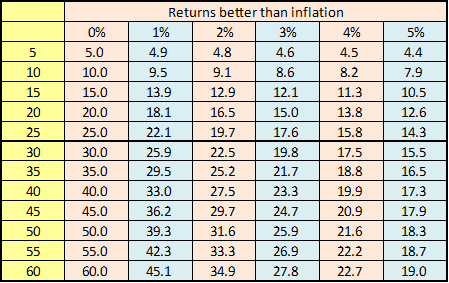 I will assume that during retirement my investments will continue to give me a return that beats inflation by 2%. I think this is a reasonable rate of return and can be achieved by a prudent mix of equity and debt investments. So for 50 retirement years at 2% real rate of return, from the table I see that I need to have saved my ~32 times annual expenses. I would also like to provide for my kids when they grow up. We have decided to leave 2 years worth of annual expenses for each kid. Finally over 50 years it is likely that we will have to spend atleast twice on extensive home repairs. So we have allocated another 2 years worth of annual expenses to big ticket home maintenance. So overall this leads to 38 times annual expenses (32 + 2+ 2+ 2) as the magic number that I need to save up, to be ready for a peaceful retirement. Next week I will write about my journey and current status to reaching this lofty goal of 32 times annual expenses as savings! I have a few queries for you. What is your age and when do you plan to retire. As one of the purpose of your blogs is to retire early…. So what is your planned early retirement age and what have you assumed is the age you and your better half will survive. Trust you have planned a corpus for the child's education? Education inflation is really high and is almost double the usual inflation levels. Hi Prashant, as I mentioned my daughter is 12 years old. I have invested in a diversified Equity Mutual Fund. The corpus as on date of this fund is Rupees twenty three lakhs. I intend to invest additional seven lakhs this year into the same. Thus taking the corpus to Rupees thirty lakhs. I am believe by the time she would need it after passing her 12th standard (if she intends to do Engineering) or 15th standard (if she wants to do her MBA). This corpus plus the growth in the next five or eight years this would be sufficient……... Please let me know your opnion. Hi Leon, I have a child in in a similar age bracket; I also recall reading elsewhere in this blog that you are looking at 'calling it a day' in August this year. I must state here that our goals and timelines are fairly similar. Education Corpus Quantum- Having compared the tuition/college fee structure, lodging/boarding costs across some key private colleges and considering higher inflation level in the education sector, you may want to up the allocation to at least Rs 45 lakhs (assuming Engineering+ MBA). If she decides to get into MBBS, then the Rs 45 lakhs to my mind is grossly insufficient. To get into any government college like NIT/Regional Engineering/IIT's is extremely tough hence one assumes private colleges here. Education Corpus -Asset Class: You seem to have invested only in one asset class i.e. equity and in one fund. There is a concentration risk here. Ideally you should invest it across asset classes. In your current strategy of one asset class/ one fund, you should withdraw the funds from this asset class/fund at least a year before you need it and move it to a FD or equivalent so that if the market tanks or crashes in the year you need the money, then you will end up withdrawing the funds in that scenario. IF you do plan to increase your education corpus, suggest that you spread it across other asset classes like Gold ETF or bonds/FD's as well so that your corpus is well spread and fall in any single asset class marked does not impact you majorly. Do feel to write to me at prashantrao@hotmail.com if you prefer..
My plan for education expenses is as follows. There is the regular tuition and other education expenses until my kids reach class 12. This will have to be supported by my annual expense allocation, including any effects of inflation. For the higher education expenses, you must allocate now, the amount that would be needed to complete say engineering Btech + MBA, at todays cost. For example, if you are planning for a Btech in a good college, you may need to allocate Rs30 Lakhs for this. This amount then needs to be invested in MF/Equities, until about 5 years from when you need it. At that point you should start shifting it to debt instruments. The hope is that the initial equity based allocation will help keep up with education inflation, so the corpus can cover for the highly inflated education costs, when you need it.